© 2012 BrianneJoy. All rights reserved. 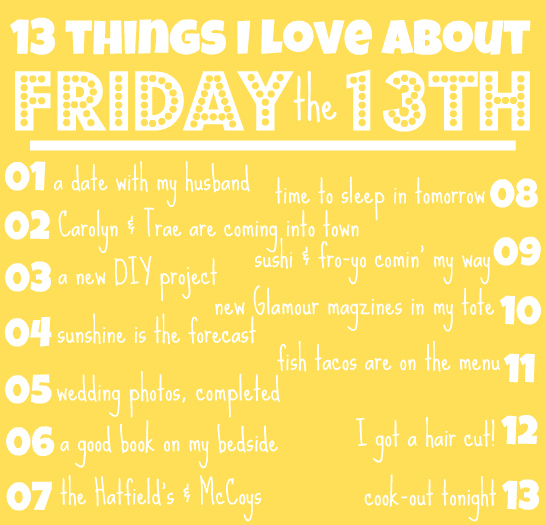 It’s Friday the 13th my friends, which means what exactly? I have not clue, except that some superstitious folks believe it to be a very, unlucky day. However, I am not a fan of the movies, nor do I believe this day to be any more unlucky than any other. I just think it’s a pretty cool day, that receives lots of recognition, and it’s pretty neat whenever a Friday falls on the 13th of the month. 2. Carolyn and Trae are visiting us from Naples, FL and we couldn’t be more excited! We haven’t seen them since our big day and they are two of our favorite people. 3. We ordered a new chair from Turner’s Furniture and it completely clashes with the color blue we painted our coffee/side tables about a month ago. So, it’s back to the drawing board – time for more decisions and paint! 4. Self-explanatory. Clear skies and sunshine, please and thank you. 5. We receive a super sweet package from our wedding photographers today! Our wedding photos are complete! Whoohoo. 6. I just got the latest book in the Bailey Flanigan series by Karen Kingsbury. It is so good. 7. Justin and I have been watching the Hatfields and McCoys television series on the History Channel…. I’m hooked! We read the Coffin Quilt in high school – and I loved it then, but it’s so good now too. 8. It’s Saturday. The only day of the week that no alarm is set. The only day I do not have to wake up to that terrible sound or hit the snooze button 15 times. 9. I’ve got high hopes that our date (#1) is for a sushi dinner and a fro-yo dessert. I never get tired of either one. 10. With sunshine in the forecast (#4) – I’m crossing my fingers for some time on the river or by the pool. Perfect time to flip the pages of the latest Glamour magazine. 11. We celebrated Daddy’s Birthday on Wednesday evening and had quite a bit of talapia leftover. So, my plan is to make some exceptional fish tacos this weekend – if I can find time. I’ll be sure to let you know how it goes. 12. I got a hair-cut on Tuesday and it’s still making me happy on Friday. Thanks, Lindsey! 13. Our good friends and fellow newlyweds, the Glows’ have invited us over to grill out tonight. I love a good dinner party. Hope you’re having as great of a Friday the 13th as I am! 13 Jul ’12 Filed under Life As I Know It. Tagged Friday, Friday the 13th. Bookmark the permalink. Post a comment. Leave a Trackback (URL).